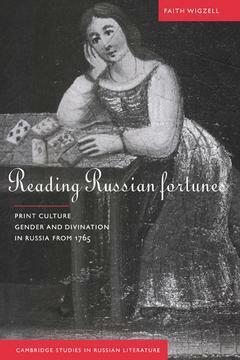 Reading Russian Fortunes examines the huge popularity and cultural impact of fortune-telling among urban and literate Russians from the eighteenth century to the present. Based partly on a study of the numerous editions of little fortune-telling books, especially those devoted to dream interpretation, it documents and analyses the social history of fortune-telling in terms of class and gender, at the same time considering the function of both amateur and professional fortune-telling in a literate modernizing society. Chapters are devoted to professional fortune-tellers and their clients, and to the publishers of the books. An analysis of the relationship between urban fortune-telling and traditional oral culture, where divination played a very significant role, leads on to a discussion of the underlying reasons for the persistence of fortune-telling in modern Russian society. Introduction, 1. Dreambooks and other fortune-telling guides, 2. Divination in Russian traditional culture, 3. Readers and detractors, 4. Printers and publishers, 5. Women, men and domestic fortune-telling, 6. Fortune-tellers and their clientele, 7. Sages and prophets, 8. Disappearance and revival, Conclusion, Bibliography.